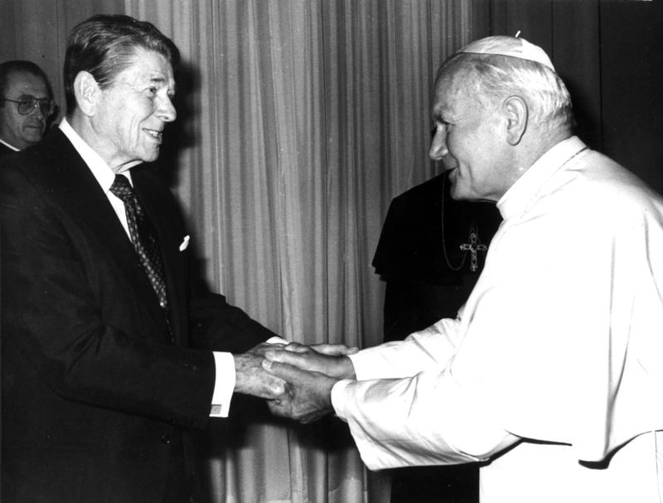 U.S. President Ronald Reagan shakes hands with Pope John Paul II during Reagan’s June 6, 1982, visit to the Vatican. The following commentary is from the September 26, 2018 Conference which celebrated the “partnership” of President Ronald Reagan & St. John Paul II. Reagan and St. John Paul shared many qualities, noted Lee Edwards, a distinguished fellow of conservative thought at the Heritage Foundation in Washington. Both had been actors. Both had been orphaned—”John Paul truly, Ronald Reagan in effect with his alcoholic father,” Edwards said. “Both took unconventional paths to positions of eminence. A Polish pope? Impossible. A Hollywood president? Impossible.” And both, he pointed out, were nearly assassinated. Both had been actors. Both had been orphaned. And both were nearly assassinated. A year later, in a speech before the National Association of Evangelicals—which was debating a “nuclear freeze” resolution that had already been approved by the Southern Baptist Convention—Reagan denounced the USSR as an “evil empire.” Four years later, speaking to Germans in West Berlin in front of the Berlin Wall, he urged then-Soviet president Mikhail Gorbachev, “Tear down this wall.” Individuals started dismantling the wall in late 1989, and the East Germans took it fully down less than a year later. “Nuclear war could not be won and should never be fought,” Meese recalled Reagan saying. That led to the Strategic Defense Initiative—derisively called “Star Wars” by critics—with the goal of knocking Soviet nuclear missiles from the sky. It also led to countermeasures to destabilize the Soviet system from within.